No other ladder compares - One Ladder Does it All . The Little Giant Ladder System® is four to five times more durable than ordinary ladders. The Little Giant is made of heavy-wall 6005-T5 aluminum. And while it possesses a workload rated capacity of 300 pounds, it has been tested to withstand four times that amount without structural failure. Little Giant Ladders are versatile. The Model Twenty-Two replaces five different size "A" frames ladders, nine different size extension ladders, two scaffolding trestles with five heights, ten staircase ladders (for working on uneven surfaces) and four 90 degree ladders (for getting closer to walls and etc.). 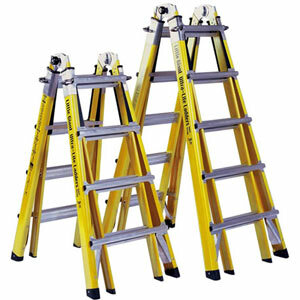 In fact, it would take nearly $800 in ordinary ladders to replace the capabilities of the Model Twenty-Two Little Giant. Even then, you would still lack the versatility, durability, and storage benefits of the Little Giant. Unbelievably, the Model Twenty-Two stores in just 5'7" of space, and weighs only 42 pounds. As if that isn't enough, the Little Giant's adjustable design allows it to be safely* used on stairs, ramps, curbs, docks, or other uneven surfaces. The Type 1A is available in Models Thirteen, Seventeen, Twenty-Two and Twenty-Six. The Little Giant Fiber Glass ladder is truly a unique ladder. It is the only ladder on the market that is made from a special high-quality resin that is non-conductive and allows the ladder to be lighter and stronger than conventional fiberglass ladders. 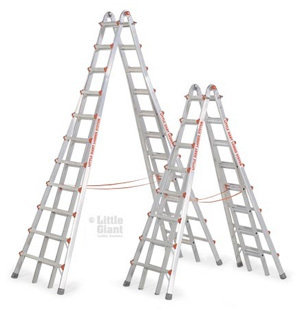 The Little Giant Fiber Glass is a Type 1A ladder that is rated at 300lbs and comes in Models Seventeen and Twenty-Two. The all new solid hinge on the Little Giant Fiber Glass ladder is revolutionary. This new Patent Pending design makes it the strongest, safest* and most technically advanced hinge on any ladder on the market today. The Little Giant Fiber Glass ladder has a one year warranty on workmanship and materials and makes any job from changing a light bulb to heavy-duty commercial projects go quicker and easier. The Little Giant Fiber Glass ladder costs far less than conventional fiberglass stepladders and extension ladders. Save money and do jobs easier, safer* and faster with a Little Giant Fiber Glass ladder. The saving of purchasing a Little Giant Ultra-Lite ladder over the conventional fiberglass stepladders and extension ladders are amazing. you will save money, weight, and time. You will be able to do a job easier, safer and Ultra-Litefaster by using a Little Giant Ultra-Lite ladder. The all new solid hinge design on the Little Giant Ultra-Lite ladder is revolutionary. The design has evolved from five generations of Little Giant hinges. The continuation of material makes it the most solid and strongest hinge to date. This new design makes it the strongest and most technically advanced hinge on any ladder on the market today. Patents pending.